This blog post is sponsored by Liberté yogurt. Although they provided the opportunity for the event in this post, all thoughts, opinions, and comments are my own — I'm not officially affiliated with the brand. Is anybody else suffering from this heatwave? I know I should be more grateful, especially considering that it's cold and rainy in Portland for nine months out of the year. But truth be told, I'm just not a summer person! I'm self-conscious about the way my thighs look in shorts and I hate how the short bike commute between my office and my house almost always results in me needing a shower, despite the fact that it's only a 3.5 mile bike ride. Okay, to be fair, I'd probably be more into summer if my house had an air conditioner. I've always thought that living in an attic-apartment with westward facing windows is a blessing, but these days I'm not so sure. By the time I'm home from work, the bright afternoon sun has turned the apartment into a 90-degree oven with little air circulation. It makes cooking and baking a nightmare. 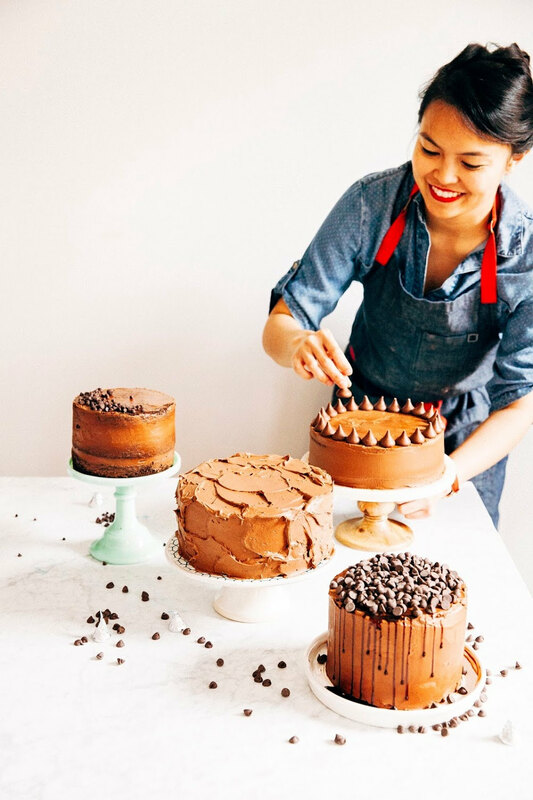 As a result, I've spent the last few weeks looking for recipes that have short cooking and baking times as a way to beat the heat. This recipe for bananas foster parfaits (as seen in the picture above) by Chef Vitaly Paley fits the bill. 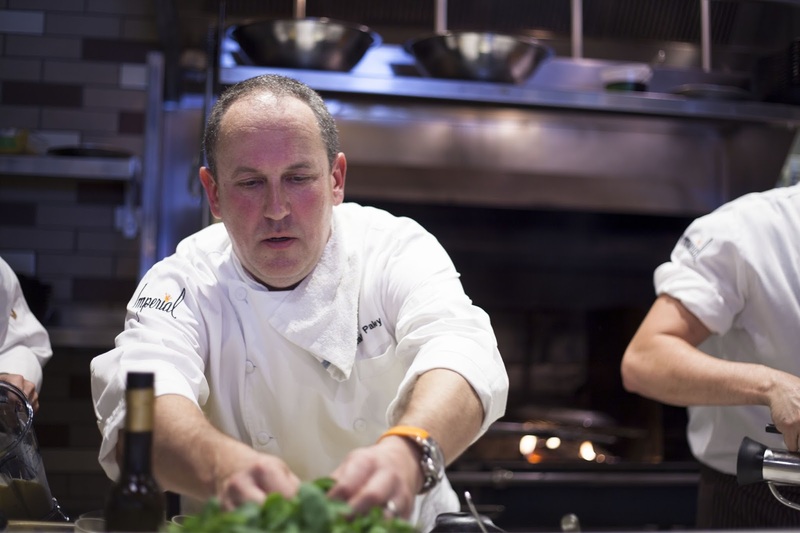 Who's Chef Vitaly Paley? I'm sure that serious foodies and Food Network buffs will recognize the name. According to my coworker Alanna, Mr. Paley's one of the only few American chefs to ever win an Iron Chef battle. 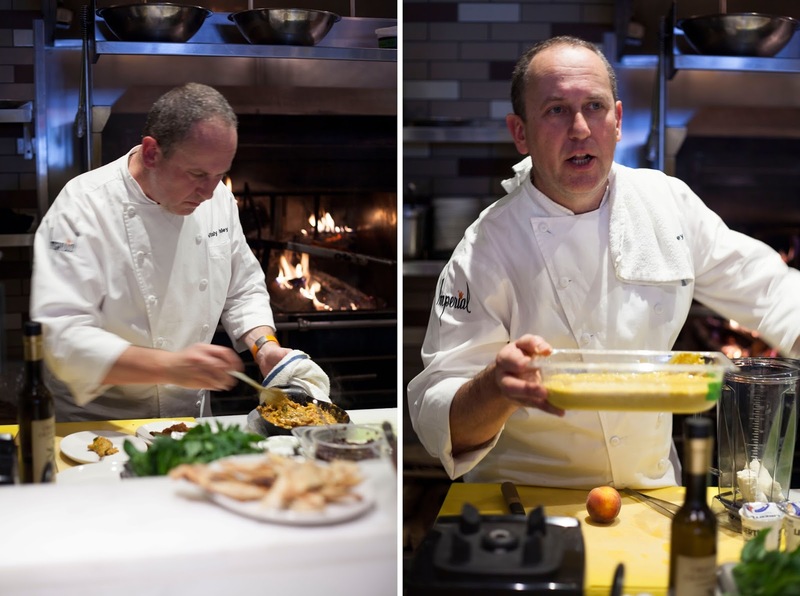 And if you're a local foodie, you've probably heard of Paley's Place, his restaurant in the NW 23rd district that earned him the James Beard award for "Best Chef in the Pacific Northwest" back in 2005. 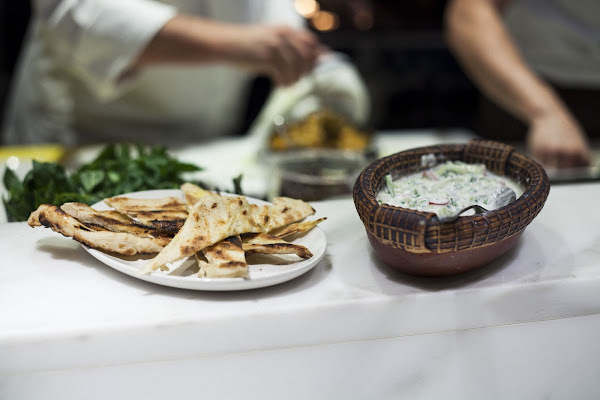 A few weeks ago, I was invited to attend a private tasting at Imperial, one of his newer restaurants (some of you might remember that I also attended a bloggers brunch there a few months ago). 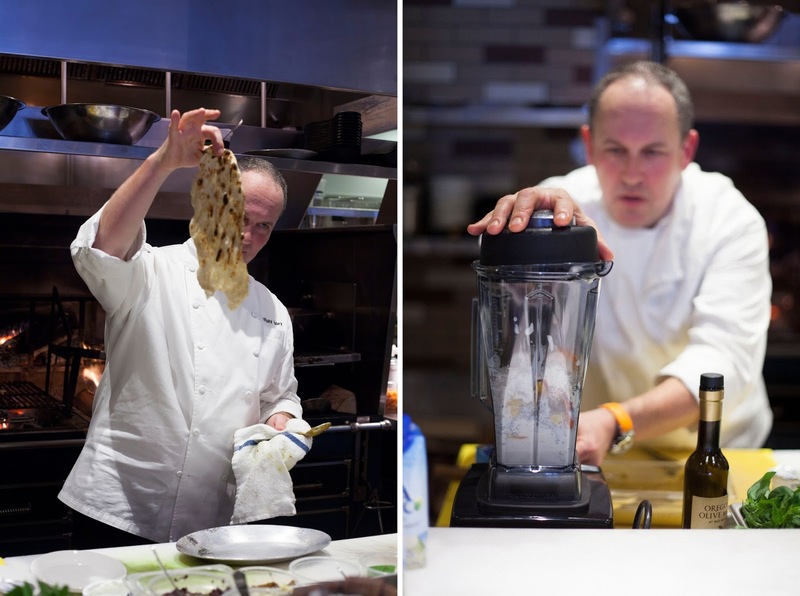 Mr. Paley had teamed up with Liberté, a Canadian yogurt company, to create a variety of unique recipes and dishes and had invited some local Portland bloggers for some private tastings. All of which were, of course, was amazing. 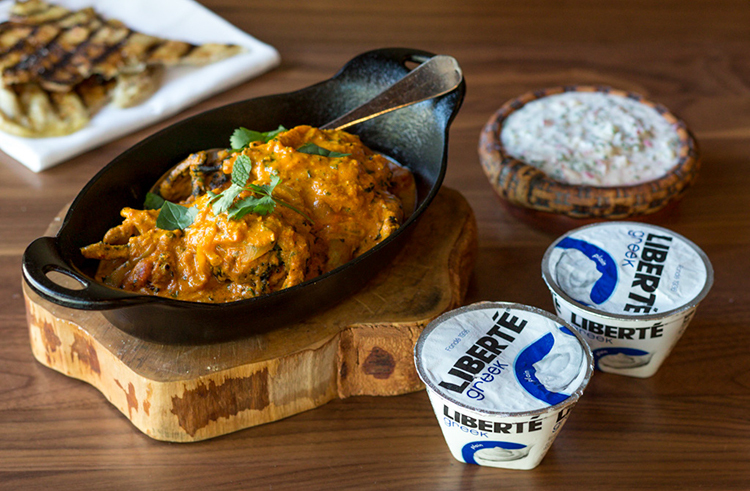 Both the quail tikka masala and cucumber raita featured plain yogurt from Liberté's Greek yogurt line. The yogurt is fat free and comes in six different flavors — I was a big fan of the lemon flavor, which had actual lemon zest in it. Pretty cool! It's rare that you find lemon yogurt that actually has zest. 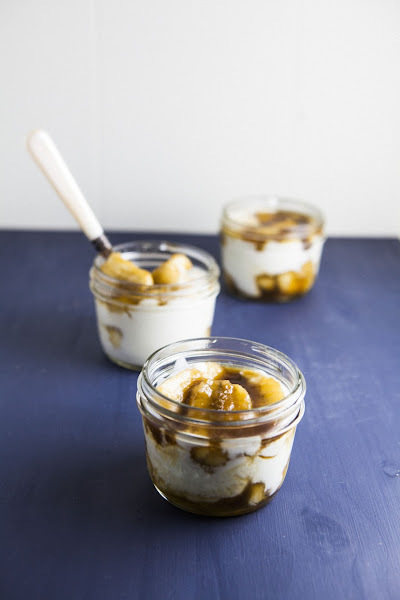 The smoothie and bananas foster parfaits, however, featured yogurt from Liberté's Mediterranean yogurt line. Unlike Liberté's Greek yogurt, the Mediterranean line is unapologetically indulgent, featuring both whole milk AND whole cream. Naturally, I preferred it to the Greek yogurt — truth be told, I wasn't entirely sure what the difference was between the two different types of yogurt before I tasted them side by side. The Mediterranean line was subtly sweeter, with a silkier and smoother texture. 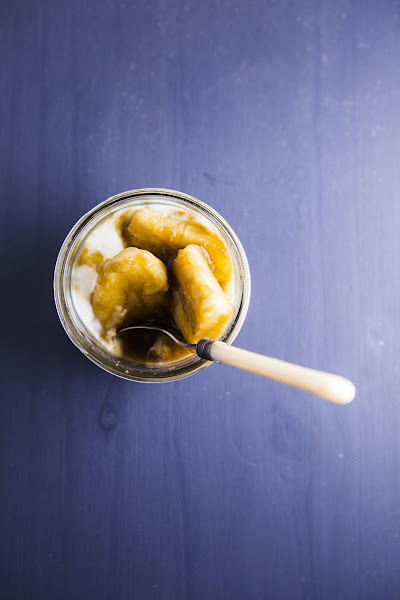 Traditionally, bananas foster is a dessert made from bananas, rum, and vanilla ice cream, but Mr. Paley definitely took a few liberties with the recipe to make it a little bit more representative of Pacific Northwest Cuisine. Mostly, he substitutes rum with locally distilled rye whiskey, and then cooks the whiskey with lots of brown sugar and a touch of butter to create a beautiful, bold caramel sauce. This sweet sauce is then complimented by the tart, vanilla flavor from Liberté's Mediterranean French Vanilla Yogurt. 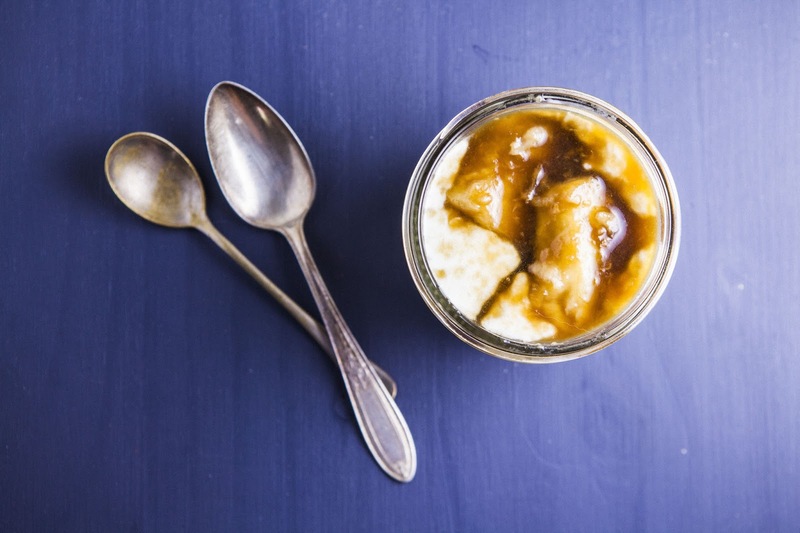 Together with the softened bananas, the whole parfait is nothing but spoonfuls of caramel cream and cream that melt in your mouth. I highly recommend using a full-fat Mediterranean yogurt like Liberté's for this recipe — it's really necessary if you want to get the creamy texture of the parfait just right. Portlanders: Liberté yogurt is available at Fred Meyers, QFC, New Seasons, and some Whole Foods locations. I used Knob Creek whiskey for the rye whiskey that the recipe calls for. The original recipe calls for 1/2 cup toasted, chopped walnuts. I wanted a creamy texture all throughout the parfait, so I omitted the nuts — feel free to add them in though! In a medium saute pan, combine 6 tablespoons brown sugar, 2 tablespoons rye whiskey, 1 tablespoon unsalted butter and a pinch of salt. 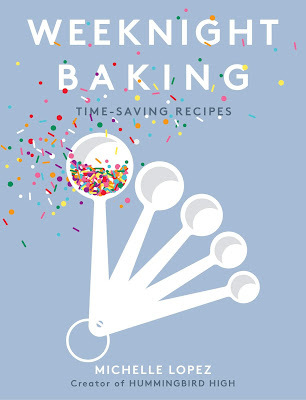 Over low heat, cook to melt sugar, using a heatproof rubber spatula to stir constantly. Continue simmering the mixture until it is thick and syrupy. Peel 2 large bananas and cut each into quarters; then, cut each quarter lengthwise for a total of 16 pieces. Add the bananas to the pan (from the 1st step) and cook until just soft. 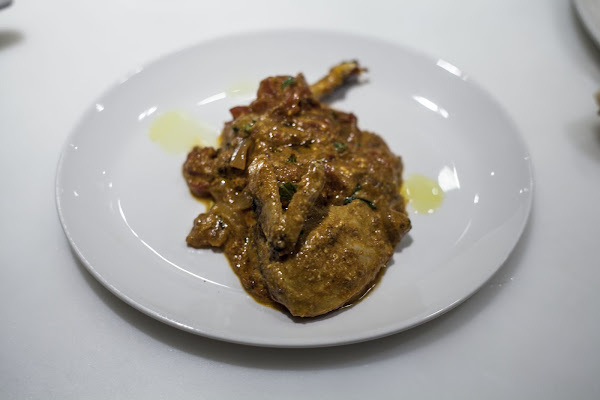 Remove pan from heat and allow the mixture to cool to room temperature completely. Once the mixture has cooled completely and you're ready to serve the parfaits, divide 6 ounces of yogurt evenly between 4 ramekins. 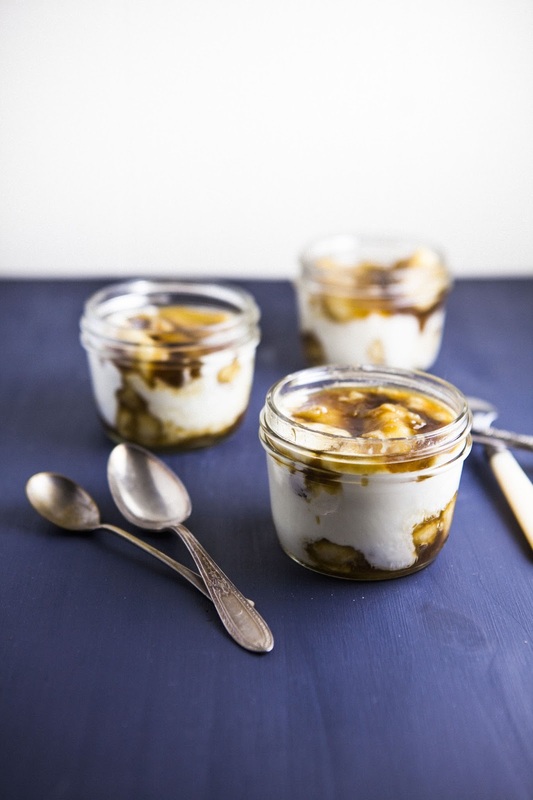 Top the yogurt with 2 banana pieces per ramekin. Spoon the remaining yogurt over the bananas, then add 2 more banana pieces to each ramekin as well as some of the pan syrup. Serve immediately. That looks delicious! I might try that the next time I need a fancy dessert! this looks like the perfect portion size for the BF too! gosh I love this dessert.